肉桂酸是乳酸运输和摄入以耐疲劳性的外源乳酸的抑制剂。肉桂酸能够引起眼外肌疲劳，同时减少眼外肌耐力和残余力量；然而，肉桂酸对腿部的趾伸长肌没有影响。相比之下，以外源乳酸代替葡萄糖代谢增加了趾伸长肌的疲劳状况，而非减轻。眼外肌疲劳仅仅出现于外源乳酸和肉桂酸共同取代葡萄糖代谢时。 Fatiguability in EOMs was only found when a combination of exogenous lactacte plus cinnamate replaced glucose. ^ 1.0 1.1 Kelly, Evelyn B. Encyclopedia of human genetics and disease. Santa Barbara, Calif.: Greenwood. 2013: 79–80. ISBN 978-0-313-38713-5. ^ Motor neurone disease. http://www.nhs.uk/. [2 January 2015]. ^ 4.0 4.1 4.2 4.3 4.4 4.5 4.6 4.7 4.8 Motor Neuron Diseases Fact Sheet. National Institute of Neurological Disorders and Stroke (NINDS). [7 November 2010]. （原始内容存档于2014年4月13日）. ^ Motor Neuron Diseases Fact Sheet. National Institute of Neurological Disorders and Stroke (NINDS). [7 November 2010]. （原始内容存档于2014年4月13日）. ^ 6.0 6.1 6.2 6.3 6.4 6.5 6.6 Kiernan, MC; Vucic, S; Cheah, BC; Turner, MR; Eisen, A; Hardiman, O; Burrell, JR; Zoing, MC. Amyotrophic lateral sclerosis.. Lancet. 12 March 2011, 377 (9769): 942–55. PMID 21296405. doi:10.1016/s0140-6736(10)61156-7. ^ Miller, RG; Mitchell, JD; Moore, DH. Riluzole for amyotrophic lateral sclerosis (ALS)/motor neuron disease (MND).. The Cochrane database of systematic reviews. 14 March 2012, 3: CD001447. PMID 22419278. doi:10.1002/14651858.CD001447.pub3. ^ McDermott, CJ; Shaw, PJ. Diagnosis and management of motor neurone disease.. BMJ (Clinical research ed.). 22 March 2008, 336 (7645): 658–62. PMID 18356234. doi:10.1136/bmj.39493.511759.be. ^ Epidemiology of Sporadic ALS. http://aces.stanford.edu/. [2 January 2015]. （原始内容存档于2015年10月8日）. ^ 11.0 11.1 11.2 11.3 Rowland LP. How amyotrophic lateral sclerosis got its name: the clinical-pathologic genius of Jean-Martin Charcot. Arch. Neurol. March 2001, 58 (3): 512–5. PMID 11255459. doi:10.1001/archneur.58.3.512. ^ Song, P. The Ice Bucket Challenge: The public sector should get ready to promptly promote the sustained development of a system of medical care for and research into rare diseases.. Intractable & rare diseases research. August 2014, 3 (3): 94–6. PMID 25364651. doi:10.5582/irdr.2014.01015. ^ 14.0 14.1 Dugdale DC, Hoch DB, Zieve D. Amyotrophic lateral sclerosis. A.D.A.M. Medical Encyclopedia. 27 August 2010. 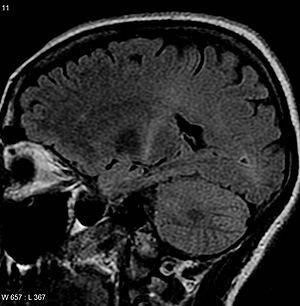 ^ Phukan J, Pender NP, Hardiman O. Cognitive impairment in amyotrophic lateral sclerosis. Lancet Neurol. 2007, 6 (11): 994–1003. PMID 17945153. doi:10.1016/S1474-4422(07)70265-X. ^ 16.0 16.1 Johnson JO, Mandrioli J, Benatar M, Abramzon Y, Van Deerlin VM, Trojanowski JQ, Gibbs JR, Brunetti M, Gronka S, Wuu J, Ding J, McCluskey L, Martinez-Lage M, Falcone D, Hernandez DG, Arepalli S, Chong S, Schymick JC, Rothstein J, Landi F, Wang YD, Calvo A, Mora G, Sabatelli M, Monsurrò MR, Battistini S, Salvi F, Spataro R, Sola P, Borghero G, Galassi G, Scholz SW, Taylor JP, Restagno G, Chiò A, Traynor BJ. Exome Sequencing Reveals VCP Mutations as a Cause of Familial ALS. Neuron. 2010, 68 (5): 857–864. PMC 3032425. PMID 21145000. doi:10.1016/j.neuron.2010.11.036. ^ Amyotrophic Lateral Sclerosis (ALS) Fact Sheet. [2015-01-02]. （原始内容存档于2015-01-04）. ^ Castrillo-Viguera C, Grasso DL, Simpson E, Shefner J, Cudkowicz ME. Clinical significance in the change of decline in ALSFRS-R. Amyotroph Lateral Scler (Journal Article). 2010, 11 (1–2): 178–80. PMID 19634063. doi:10.3109/17482960903093710. ^ Sabatelli M, Madia F, Conte A, Luigetti M, Zollino M, Mancuso I, Lo Monaco M, Lippi G, Tonali P. Natural history of young-adult amyotrophic lateral sclerosis. Neurology. 16 September 2008, 71 (12): 876–81. PMID 18596241. doi:10.1212/01.wnl.0000312378.94737.45. ^ 22.0 22.1 Chiò A, Calvo A, Moglia C, Mazzini L, Mora G. Phenotypic heterogeneity of amyotrophic lateral sclerosis: A population based study. Journal of Neurology, Neurosurgery & Psychiatry. 2011, 82 (7): 740–746. PMID 21402743. doi:10.1136/jnnp.2010.235952. ^ Lopez-Lopez A, Gamez J, Syriani E, Morales M, Salvado M, Rodríguez MJ, Mahy N, Vidal-Taboada JM. CX3CR1 Is a Modifying Gene of Survival and Progression in Amyotrophic Lateral Sclerosis. PLoS ONE. 2014, 9 (5): e96528. PMC 4013026. PMID 24806473. doi:10.1371/journal.pone.0096528. ^ Turner MR, Parton MJ, Shaw CE, Leigh PN, Al-Chalabi A. Prolonged survival in motor neuron disease: a descriptive study of the King's database 1990–2002. J Neurol Neurosurg Psychiatry. 2003, 74 (7): 995–997. PMC 1738535. PMID 12810805. doi:10.1136/jnnp.74.7.995. ^ Palmowski A, Jost WH, Prudlo J, Osterhage J, Käsmann B, Schimrigk K, Ruprecht KW. Eye movement in amyotrophic lateral sclerosis: a longitudinal study. Ger J Ophthalmol. 1995, 4 (6): 355–62. PMID 8751101. ^ Kallestad KM, Hebert SL, McDonald AA, Daniel ML, Cu SR, McLoon LK. Sparing of extraocular muscle in aging and muscular dystrophies: a myogenic precursor cell hypothesis. Exp. Cell Res. 2011, 317 (6): 873–85. PMC 3072110. PMID 21277300. doi:10.1016/j.yexcr.2011.01.018. ^ Cookson, Mark R.; Wingo, Thomas S.; Cutler, David J.; Yarab, Nicole; Kelly, Crystal M.; Glass, Jonathan D. The Heritability of Amyotrophic Lateral Sclerosis in a Clinically Ascertained United States Research Registry. PLoS ONE. 2011, 6 (11): e27985. ISSN 1932-6203. doi:10.1371/journal.pone.0027985. ^ Sontheimer, Harald. Diseases of the Nervous System. Academic Press. 2015: 170 [2015-05-02]. ISBN 978-0-12-800403-6. ^ Conwit RA. Preventing familial ALS: A clinical trial may be feasible but is an efficacy trial warranted?. Journal of the Neurological Sciences. December 2006, 251 (1–2): 1–2. ISSN 0022-510X. PMID 17070848. doi:10.1016/j.jns.2006.07.009. ^ 33.0 33.1 Al-Chalabi A, Leigh PN. Recent advances in amyotrophic lateral sclerosis. Current Opinion in Neurology. August 2000, 13 (4): 397–405. ISSN 1473-6551. PMID 10970056. doi:10.1097/00019052-200008000-00006. ^ Battistini S, Ricci C, Lotti EM, Benigni M, Gagliardi S, Zucco R, Bondavalli M, Marcello N, Ceroni M, Cereda C. Severe familial ALS with a novel exon 4 mutation (L106F) in the SOD1 gene. Journal of the Neurological Sciences. June 2010, 293 (1): 112–115. PMID 20385392. doi:10.1016/j.jns.2010.03.009. ^ Andersen PM, Forsgren L, Binzer M, Nilsson P, Ala-Hurula V, Keränen ML, Bergmark L, Saarinen A, Haltia T, Tarvainen I, Kinnunen E, Udd B, Marklund SL. Autosomal recessive adult-onset amyotrophic lateral sclerosis associated with homozygosity for Asp90Ala CuZn-superoxide dismutase mutation, A clinical and genealogical study of 36 patients. Brain. 1996, 119 (4): 1153–1172. PMID 8813280. doi:10.1093/brain/119.4.1153. ^ DeJesus-Hernandez M, Mackenzie IR, Boeve BF, Boxer AL, Baker M, Rutherford NJ, Nicholson AM, Finch NA, Flynn H, Adamson J, Kouri N, Wojtas A, Sengdy P, Hsiung GY, Karydas A, Seeley WW, Josephs KA, Coppola G, Geschwind DH, Wszolek ZK, Feldman H, Knopman DS, Petersen RC, Miller BL, Dickson DW, Boylan KB, Graff-Radford NR, Rademakers R. Expanded GGGGCC Hexanucleotide Repeat in Noncoding Region of C9ORF72 Causes Chromosome 9p-Linked FTD and ALS (PDF). Neuron. 2011, 72 (2): 245–56. PMC 3202986. PMID 21944778. doi:10.1016/j.neuron.2011.09.011. （原始内容 (PDF)存档于2014-11-29）. ^ 37.0 37.1 Majounie E, Renton AE, Mok K, Dopper EG, Waite A, Rollinson S, Chiò A, Restagno G, Nicolaou N, Simon-Sanchez J, van Swieten JC, Abramzon Y, Johnson JO, Sendtner M, Pamphlett R, Orrell RW, Mead S, Sidle KC, Houlden H, Rohrer JD, Morrison KE, Pall H, Talbot K, Ansorge O, Hernandez DG, Arepalli S, Sabatelli M, Mora G, Corbo M, Giannini F, Calvo A, Englund E, Borghero G, Floris GL, Remes AM, Laaksovirta H, McCluskey L, Trojanowski JQ, Van Deerlin VM, Schellenberg GD, Nalls MA, Drory VE, Lu CS, Yeh TH, Ishiura H, Takahashi Y, Tsuji S, Le Ber I, Brice A, Drepper C, Williams N, Kirby J, Shaw P, Hardy J, Tienari PJ, Heutink P, Morris HR, Pickering-Brown S, Traynor BJ. Frequency of the C9orf72 hexanucleotide repeat expansion in patients with amyotrophic lateral sclerosis and frontotemporal dementia: a cross-sectional study. Lancet Neurol. 2012, 11 (4): 323–30. PMC 3322422. PMID 22406228. doi:10.1016/S1474-4422(12)70043-1. ^ Buchan JR, Kolaitis RM, Taylor JP, Parker R. Eukaryotic stress granules are cleared by autophagy and Cdc48/VCP function. Cell. 20 June 2013, 153 (7): 1461–74. PMC 3760148. PMID 23791177. doi:10.1016/j.cell.2013.05.037. ^ Deng HX, Chen W, Hong ST, Boycott KM, Gorrie GH, Siddique N, Yang Y, Fecto F, Shi Y, Zhai H, Jiang H, Hirano M, Rampersaud E, Jansen GH, Donkervoort S, Bigio EH, Brooks BR, Ajroud K, Sufit RL, Haines JL, Mugnaini E, Pericak-Vance MA, Siddique T. Mutations in UBQLN2 cause dominant X-linked juvenile and adult-onset ALS and ALS/dementia. Nature. 2011, 477 (7363): 211–215. PMC 3169705. PMID 21857683. doi:10.1038/nature10353. ^ Al-Saif A, Al-Mohanna F, Bohlega S. A mutation in sigma-1 receptor causes juvenile amyotrophic lateral sclerosis. Annals of Neurology. 2011, 70 (6): 913–919. PMID 21842496. doi:10.1002/ana.22534. ^ Wu CH, Fallini C, Ticozzi N, Keagle PJ, Sapp PC, Piotrowska K, Lowe P, Koppers M, McKenna-Yasek D, Baron DM, Kost JE, Gonzalez-Perez P, Fox AD, Adams J, Taroni F, Tiloca C, Leclerc AL, Chafe SC, Mangroo D, Moore MJ, Zitzewitz JA, Xu ZS, van den Berg LH, Glass JD, Siciliano G, Cirulli ET, Goldstein DB, Salachas F, Meininger V, Rossoll W, Ratti A, Gellera C, Bosco DA, Bassell GJ, Silani V, Drory VE, Brown RH, Landers JE. Mutations in the profilin 1 gene cause familial amyotrophic lateral sclerosis. Nature. 2012, 488 (7412): 499–503. PMC 3575525. PMID 22801503. doi:10.1038/nature11280. ^ Takahashi Y, Fukuda Y, Yoshimura J, Toyoda A, Kurppa K, Moritoyo H, Belzil VV, Dion PA, Higasa K, Doi K, Ishiura H, Mitsui J, Date H, Ahsan B, Matsukawa T, Ichikawa Y, Moritoyo T, Ikoma M, Hashimoto T, Kimura F, Murayama S, Onodera O, Nishizawa M, Yoshida M, Atsuta N, Sobue G, Fifita JA, Williams KL, Blair IP, Nicholson GA, Gonzalez-Perez P, Brown RH, Nomoto M, Elenius K, Rouleau GA, Fujiyama A, Morishita S, Goto J, Tsuji S. ERBB4 mutations that disrupt the neuregulin-ErbB4 pathway cause amyotrophic lateral sclerosis type 19. Am. J. Hum. Genet. 2013, 93 (5): 900–5. PMC 3824132. PMID 24119685. doi:10.1016/j.ajhg.2013.09.008. ^ Kim HJ, Kim NC, Wang YD, Scarborough EA, Moore J, Diaz Z, MacLea KS, Freibaum B, Li S, Molliex A, Kanagaraj AP, Carter R, Boylan KB, Wojtas AM, Rademakers R, Pinkus JL, Greenberg SA, Trojanowski JQ, Traynor BJ, Smith BN, Topp S, Gkazi AS, Miller J, Shaw CE, Kottlors M, Kirschner J, Pestronk A, Li YR, Ford AF, Gitler AD, Benatar M, King OD, Kimonis VE, Ross ED, Weihl CC, Shorter J, Taylor JP. Mutations in the prion-like domains of hnRNPA2B1 and hnRNPA1 cause multisystem proteinopathy and ALS. Nature. 28 March 2013, 495 (7442): 467–73. PMC 3756911. PMID 23455423. doi:10.1038/nature11922. ^ Bruijn LI, Houseweart MK, Kato S, Anderson KL, Anderson SD, Ohama E, Reaume AG, Scott RW, Cleveland DW. Aggregation and motor neuron toxicity of an ALS-linked SOD1 mutant independent from wild-type SOD1. Science. 1998, 281 (5384): 1851–4. PMID 9743498. doi:10.1126/science.281.5384.1851. ^ Reaume AG, Elliott JL, Hoffman EK, Kowall NW, Ferrante RJ, Siwek DF, Wilcox HM, Flood DG, Beal MF, Brown RH, Scott RW, Snider WD. Motor neurons in Cu/Zn superoxide dismutase-deficient mice develop normally but exhibit enhanced cell death after axonal injury. Nat Genet. 1996, 13 (1): 43–7. PMID 8673102. doi:10.1038/ng0596-43. ^ Furukawa Y, Fu R, Deng HX, Siddique T, O'Halloran TV. Disulfide cross-linked protein represents a significant fraction of ALS-associated Cu, Zn-superoxide dismutase aggregates in spinal cords of model mice. Proc Natl Acad Sci USA. 2006, 103 (18): 7148–53. PMC 1447524. PMID 16636274. doi:10.1073/pnas.0602048103. ^ Boillée S, Vande Velde C, Cleveland DW. ALS: a disease of motor neurons and their nonneuronal neighbors. Neuron. 2006, 52 (1): 39–59. PMID 17015226. doi:10.1016/j.neuron.2006.09.018. ^ Manuel M, Heckman CJ. Stronger is not always better: could a bodybuilding dietary supplement lead to ALS?. Exp Neurol (Review). March 2011, 228 (1): 5–8. PMC 3049458. PMID 21167830. doi:10.1016/j.expneurol.2010.12.007. ^ Carunchio I, Curcio L, Pieri M, Pica F, Caioli S, Viscomi MT, Molinari M, Canu N, Bernardi G, Zona C. Increased levels of p70S6 phosphorylation in the G93A mouse model of amyotrophic lateral sclerosis and in valine-exposed cortical neurons in culture. Experimental Neurology. 2010, 226 (1): 218–230. PMID 20832409. doi:10.1016/j.expneurol.2010.08.033. ^ Fernández-Borges N, Eraña H, Elezgarai SR, Harrathi C, Gayosso M, Castilla J. Infectivity versus seeding in neurodegenerative diseases sharing a prion-like mechanism. Int J Cell Biol. 25 September 2013, 2013: 583498. PMC 3800648. PMID 24187553. doi:10.1155/2013/583498. ^ Holtcamp, W. The emerging science of BMAA: do cyanobacteria contribute to neurodegenerative disease?. Environmental health perspective. 2012, 120 (3). PMC 3295368. PMID 22382274. doi:10.1289/ehp.120-a110. ^ Rodgers KJ. Non-protein amino acids and neurodegeneration: The enemy within. Experimental Neurology. March 2014, 253: 192–196. PMID 24374297. doi:10.1016/j.expneurol.2013.12.010. ^ 54.0 54.1 Rosenbohm, A., Kassubek, J., Weydt, P., Marroquin, N., Volk, A., Kubisch, C., Huppertz, H., & Weber, M. (2014). Can lesions to the motor cortex induce amyotrophic lateral sclerosis? . J Neurol, 261, 283-290. ^ 55.0 55.1 55.2 Walling A. Amyotrophic lateral sclerosis: Lou Gehrig's disease. American Family Physician. 1999, 59 (6): 1489–96. ^ Sutedja NA, Fischer K, Veldink JH, van der Heijden GJ, Kromhout H, Heederik D, Huisman MH, Wokke JJ, van den Berg LH. What we truly know about occupation as a risk factor for ALS: a critical and systematic review. Amyotrophic Lateral Sclerosis. 2009, 10 (5–6): 295–301. PMID 19922116. doi:10.3109/17482960802430799. ^ Deng HX, Chen W, Hong ST, Boycott KM, Gorrie GH, Siddique N, Yang Y, Fecto F, Shi Y, Zhai H, Jiang H, Hirano M, Rampersaud E, Jansen GH, Donkervoort S, Bigio EH, Brooks BR, Ajroud K, Sufit RL, Haines JL, Mugnaini E, Pericak-Vance MA, Siddique T. Mutations in UBQLN2 cause dominant X-linked juvenile and adult onset ALS and ALS/dementia. Nature. 2011-08-21, 477 (7363): 211–5. PMC 3169705. PMID 21857683. doi:10.1038/nature10353. ^ Deng HX, Zhai H, Bigio EH, Yan J, Fecto F, Ajroud K, Mishra M, Ajroud-Driss S, Heller S, Sufit R, Siddique N, Mugnaini E, Siddique T. FUS-immunoreactive inclusions are a common feature in sporadic and non-SOD1 familial amyotrophic lateral sclerosis. Ann Neurol. June 2010, 67 (6): 739–48. PMID 20517935. doi:10.1002/ana.22051. ^ 63.0 63.1 63.2 63.3 Andrade FH, McMullen CA. Lactate is a metabolic substrate that sustains extraocular muscle function. Pflugers Arch. 2006, 452 (1): 102–8. PMID 16328456. doi:10.1007/s00424-005-0010-0. ^ Hänsel Y, Ackerl M, Stanek G. ALS-like sequelae in chronic neuroborreliosis. Wien Med Wochenschr. 1995, 145 (7–8): 186–8. PMID 7610670. ^ el Alaoui-Faris M, Medejel A, al Zemmouri K, Yahyaoui M, Chkili T. Amyotrophic lateral sclerosis syndrome of syphilitic origin. 5 cases. Rev Neurol (Paris). 1990, 146 (1): 41–4. PMID 2408129. ^ Umanekiĭ KG, Dekonenko EP. Structure of progressive forms of tick-borne encephalitis. Zh Nevropatol Psikhiatr Im S S Korsakova. 1983, 83 (8): 1173–9. PMID 6414202. ^ Silani V, Messina S, Poletti B, Morelli C, Doretti A, Ticozzi N, Maderna L. The diagnosis of Amyotrophic lateral sclerosis in 2010. Archives italiennes de biologie. 2011, 149 (1): 5–27. PMID 21412713. doi:10.4449/aib.v149i1.1260. ^ Eisen, A. Amyotrophic lateral sclerosis: A review. BCMJ. 2002, 44 (7): 362–366. ^ Davenport RJ, Swingler RJ, Chancellor AM, Warlow CP. Avoiding false positive diagnoses of motor neuron disease: lessons from the Scottish Motor Neuron Disease Register. J. Neurol. Neurosurg. Psychiatr. 1996, 60 (2): 147–51. PMC 1073793. PMID 8708642. doi:10.1136/jnnp.60.2.147. ^ Chieia MA, Oliveira AS, Silva HC, Gabbai AA. Amyotrophic lateral sclerosis: Considerations on diagnostic criteria (PDF). Arquivos de Neuro-Psiquiatria. 2010, 68 (6): 837–842. PMID 21243238. doi:10.1590/S0004-282X2010000600002. ^ Al-Asmi A, Nandhagopal R, Jacob PC, Gujjar A. Misdiagnosis of Myasthenia Gravis and Subsequent Clinical Implication: A case report and review of literature. Sultan Qaboos University medical journal. 2012, 12 (1): 103–108. PMC 3286704. PMID 22375266. doi:10.12816/0003095. ^ Lambert-Eaton Myasthenic Syndrome (LEMS). Misc.medscape.com. [18 April 2013]. ^ LEMS.com, Lambert-Eaton Myasthenic Syndrome: About. Lems.com. [18 April 2013]. ^ Carlesi C, Pasquali L, Piazza S, Lo Gerfo A, Caldarazzo Ienco E, Alessi R, Fornai F, Siciliano G. Strategies for clinical approach to neurodegeneration in Amyotrophic lateral sclerosis. Archives italiennes de biologie. March 2011, 149 (1): 151–67. PMID 21412722. doi:10.4449/aib.v149i1.1267. ^ Miller RG, Mitchell JD, Lyon M, Moore DH. Miller, Robert G, 编. Riluzole for amyotrophic lateral sclerosis (ALS)/motor neuron disease (MND). Cochrane Database of Systematic Reviews. 2007, (1): CD001447. PMID 17253460. doi:10.1002/14651858.CD001447.pub2. ^ Russell P, Harrison R. What is amyotrophic lateral sclerosis. Clinical Pharmacist. 2014, 6 (7). ^ Sviri S, Linton DM, van Heerden PV. Non-invasive Mechanical Ventilation Enhances Patient Autonomy in Decision-Making Regarding Chronic Ventilation. Critical Care and Resuscitation. Jun 2005, 7 (2): 116–118. PMID 16548804. ^ Lewis M, Rushanan S. The role of physical therapy and occupational therapy in the treatment of Amyotrophic Lateral Sclerosis. NeuroRehabilitation. 2007, 22 (6): 451–461. PMID 18198431. ^ Kasarskis EJ, Berryman S, Vanderleest JG, Schneider AR, McClain CJ. Nutritional status of patients with amyotrophic lateral sclerosis: relation to the proximity of death. Am J Clin Nutr. Jan 1996, 63 (1): 130–7. PMID 8604660. doi:10.1093/ajcn/63.1.130. ^ Holm T, Maier A, Wicks P, Lang D, Linke P, Münch C, Steinfurth L, Meyer R, Meyer T. Severe Loss of Appetite in Amyotrophic Lateral Sclerosis Patients: Online Self-Assessment Study. Interact J Med Res. Apr 2013, 2 (1): e8. PMC 3632382. PMID 23608722. doi:10.2196/ijmr.2463. ^ Hamadeh MJ, Rodriguez MC, Kaczor JJ, Tarnopolsky MA. Caloric restriction transiently improves motor performance but hastens clinical onset of disease in the Cu/Zn-superoxide dismutase mutant G93A mouse. Muscle Nerve. Feb 2005, 31 (2): 214–20. PMID 15625688. doi:10.1002/mus.20255. ^ Payne, C; Wiffen, PJ; Martin, S. Interventions for fatigue and weight loss in adults with advanced progressive illness.. The Cochrane database of systematic reviews. 18 January 2012, 1: CD008427. PMID 22258985. doi:10.1002/14651858.cd008427.pub2. ^ ALS Association. Quick Facts About ALS & The ALS Association. ^ ALS Topic Overview. [2008-05-01]. （原始内容存档于2008年5月1日）. ^ Gordon, Paul. "Amyotrophic Lateral Sclerosis. Pathophysiology, Diagnosis and Management." CNS Drugs, 25.1 (2011):1-15. ^ Sla, indagini nei club. Pesticidi nel mirino. [2008-10-02]. （原始内容存档于2008年10月3日）. ^ Wicks P, Abrahams S, Masi D, Hejda-Forde S, Leigh PN, Goldstein LH. The Prevalence of Depression and Anxiety in MND. Amyotrophic Lateral Sclerosis and Other Motor Neuron Disorders. 2005, 6 (Supplement 1): 147. ISSN 1466-0822. ^ Rachele MG, Mascia V, Tacconi P, Dessi N, Marrosu F, Giagheddu M. Conjugal amyotrophic lateral sclerosis: a report on a couple from Sardinia, Italy. Ital J Neurol Sci. April 1998, 19 (2): 97–100. PMID 10935845. doi:10.1007/BF02427565. ^ Poloni M, Micheli A, Facchetti D, Mai R, Ceriani F, Cattalini C. Conjugal amyotrophic lateral sclerosis: toxic clustering or change?. Ital J Neurol Sci. April 1997, 18 (2): 109–12. PMID 9239532. doi:10.1007/BF01999572. ^ Camu W, Cadilhac J, Billiard M. Conjugal amyotrophic lateral sclerosis: a report on two couples from southern France. Neurology. March 1994, 44 (3 Pt 1): 547–8. PMID 8145930. doi:10.1212/WNL.44.3_Part_1.547. ^ Cornblath DR, Kurland LT, Boylan KB, Morrison L, Radhakrishnan K, Montgomery M. Conjugal amyotrophic lateral sclerosis: report of a young married couple. Neurology. November 1993, 43 (11): 2378–80. PMID 8232960. doi:10.1212/WNL.43.11.2378. ^ Corcia P, Jafari-Schluep HF, Lardillier D, Mazyad H, Giraud P, Clavelou P, Pouget J, Camu W. A clustering of conjugal amyotrophic lateral sclerosis in southeastern France. Neurol. November 2003, 60 (4): 553–7. PMID 12707069. doi:10.1001/archneur.60.4.553. ^ George Bush delivers possibly the best ALS ice bucket challenge yet. Independent. [20 August 2014].